Join us to celebrate the opening night of Every Picture Tells a Story on Friday 2nd November 6-9pm. The show will mark the 50th exhibition in the Sunny Bank Mills Gallery and continues until 6th January 2019. Every Picture Tells a Story features a new body of work by the talented painter Mel Davies and Jewellery Maker, Emma White, and promises to be a fascinating collaboration from these great storytellers. Although working in two vastly different mediums each artist is telling tales in their own, very individual, way. The show is shaping up to be a wonderful marriage of big, bold and funny paintings, bursting with colourful decadence and bespoke handmade jewellery in silver and gold, weaving subtle stories on long silver ribbons. 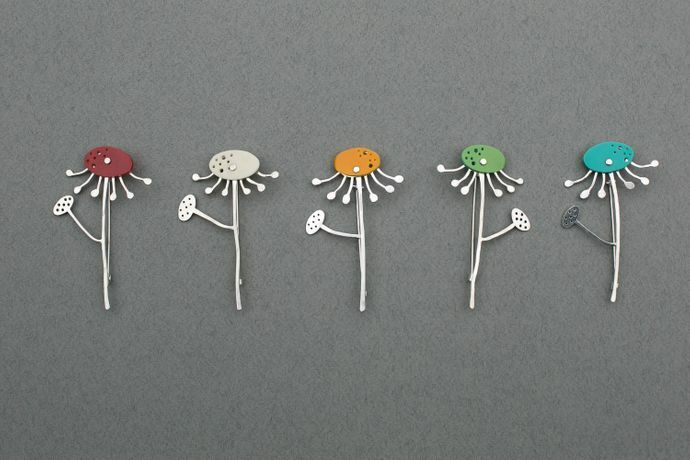 Alongside Emma White, jewellery makers Evie Milo, Charlotte Whitmore and Helena Russell will also exhibit their work. 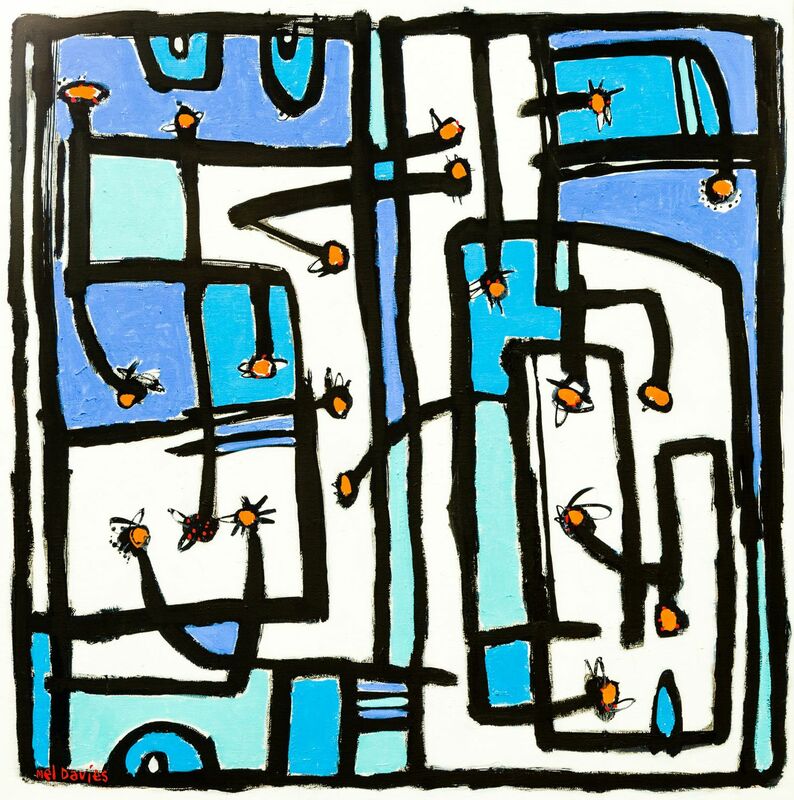 Mel Davies is a well known and well loved local painter, who’s distinctive bright palette and wonderful characters, jump from the walls and fill the room with their fun and exuberance. He works from his studio in Sunny Bank Mills, this will be Mel’s 8th show at the gallery and he will be showing a multitude of paintings from the last year, selected carefully from his large body of work. Emma White is a local Jewellery Maker, working in silver and gold on handmade designs and commissions for private customers. Emma is fascinated by the stories that her customers bring to her and her work is centred around celebrating and immortalising those stories. This show includes the tales of new love, children born, people lost, hope after tragedy. The jewellery, mainly necklaces and bangles, are made from long ribbons of silver wire which have been stamped with tiny little letters, each only 1mm tall. Each letter is stamped one by one until a story is formed, some of the larger pieces are a meter long before they are curled to become jewellery. The silver wire ‘ribbon’ is then twisted into a ‘tangled tale’, a knotted design, a spiral, a twist. Each becomes a piece of history which will carry those stories forward even after we have all gone. Also showing is Emma’s colleague and fellow Jewellery Maker, Evie Milo, master upcycler and talented designer in a number of mediums. 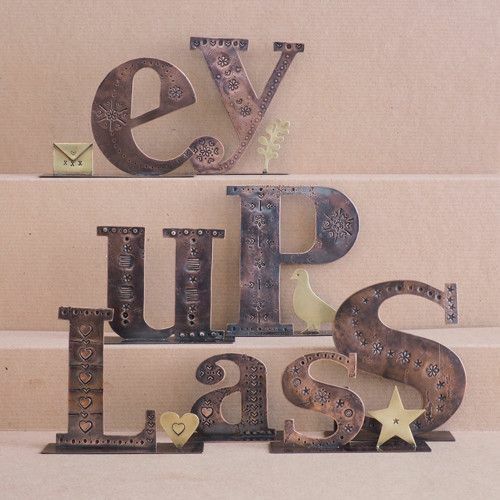 Evie is showing a series of freestanding typeface letters, from flattened copper plumbing pipes, spelling out well known Yorkshire phrases from her hometown of Leeds. Look our for ‘JAMMY GIT’ ‘EY UP LASS’ and ‘FLIPPIN ECK’ or even commission your own special phrase. Charlotte Whitmore works predominantly in silver, incorporating other materials such as vintage plastics (Bakelite, Casein, Lucite) and Czech glass to add colour and interest to the jewellery she creates. she designs simple forms which she embellishes with techniques such as hand stamping, etching and reticulation, and always hunts for vintage tools to be re-purposed for hammering, to create interesting patterns and textures. Her inspiration comes from the surrounding landscape. Tall, waving grasses, delicate wild flowers and sculptural seed heads that can be found in the hedgerows and along the towpaths near where she lives. 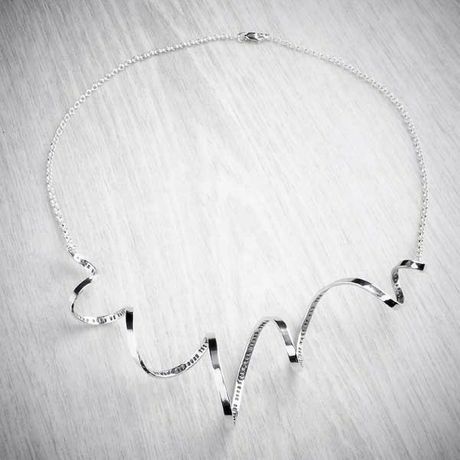 Helena is a Sheffield based metalsmith who designs and makes work which all have the aim to encourage interaction whether that is through the finish, shape or use of the object. 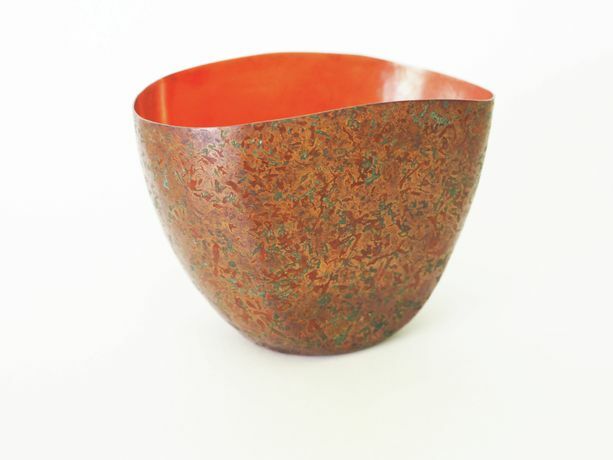 Dissimilarity is a collection of copper vessels that explore the different finishes caused during a process called patination, a technique that uses a range of different chemical mixtures and ways of applying that effect the surface of the metal. Each piece has been polished on the inside to create a contrast to the patina and to allow the natural copper colour, this also appears to let the piece illuminate from the inside.